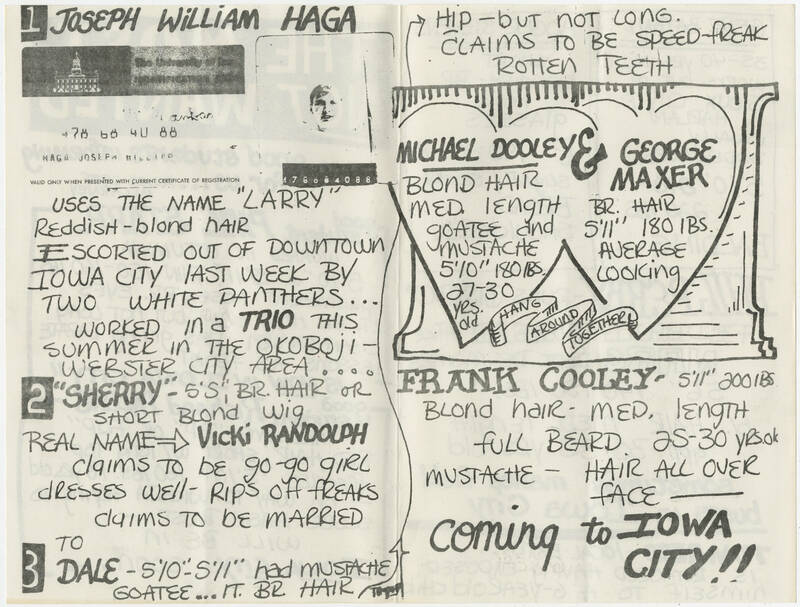 1 JOSEPH WILLIAM HAGA 478 68 40 88 HAGA, JOSEPH WILLIA VALID ONLY WHEN PRESENTED WITH CURRENT CERTIFICATE OF REGISTRATION 476064088 USES THE NAME "LARRY" Reddish-blond hair ESCORTED OUT OF DOWNTOWN IOWA CITY LAST WEEK BY TWO WHITE PANTHERS... WORKED IN A TRIO THIS SUMMER IN THE OKOBOJI WEBSTER CITY AREA. . . 2 "SHERRY" - 5'5" BR. HAIR OR SHORT BLOND WIG REAL NAME VICKI RANDOLPH claims to be go-go girl dresses well - rips off freaks claims to be married to 3 DALE - 5'10"- 5'11" had mustache goatee... it br. hair Hip- but not long. claims to be speed freak rotten teeth MICHAEL DOOLEY BLOND HAIR MED LENGTH GOATEE AND MUSTACHE 5'10" 180lbs 27-30 YRS old. & GEORGE MAXER BR. HAIR 5'11" 180 lbs Average Looking HANG AROUND TOGETHER FRANK COOLEY - 5'11" 200 lbs BLOND HAIR, MED LENGTH full beard 25-30 yrs ok Mustache - hair all over face coming to IOWA CITY ! !